Click here to view historic sales data for Northeast Colorado Springs. 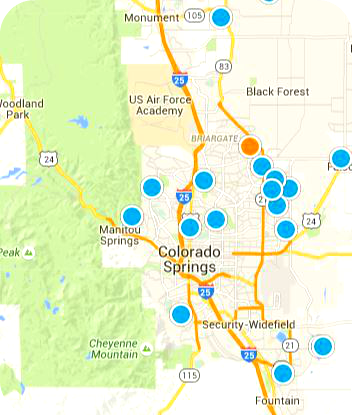 Scroll down to view the latest listings in Northeast Colorado Springs. Northeast Colorado Springs encompasses the area around UCCS, from Woodmen Road in the north to Fillmore Street in the south. Centennial Boulevard provides the western boundary, while Union Boulevard marks the eastern border. The entire area offers recreational opportunities, growing shopping areas, and a central location that offers easy access to the rest of Colorado Springs. The University of Colorado at Colorado Springs , one of four University of Colorado campuses, was established in 1965. It is currently the fastest growing campus in the CU system, hosting approximately 12,000 students annually. Through the six colleges of the campus, UCCS offers 45 bachelor's degrees, 22 master's degrees, and five doctoral degrees. The neighborhood surrounding the college provides many opportunities for student rental, and many students find jobs at the University Village shopping center or in downtown Colorado Springs. Students and residents alike can enjoy the great outdoors throughout the entire neighborhood. Pulpit Rock Park, a part of the 500-acre Austin Bluffs Open Space, includes several trails with a main route that leads to top of the bluff where hikers are met with beautiful views of the Front Range. The Rockrimmon Open Space offers 1.3 miles of trail, allowing horseback riding, mountain biking, and hiking. Goose Gossage Youth Sports Complex, named after the major league baseball player from the Springs, provides the public with access to several baseball fields, a huge area of open grass, a skatepark, and a dirt BMX course. Several neighborhood parks have been built in the area, many of which offer open areas, basketball courts, and playgrounds. Shopping is no hassle in northeast Colorado Springs. The University Village shopping area offers great retail shopping, specialty stores, and a variety of food indulgences. Restaurants include Bonefish Grill, Hacienda Colorado, and Cowboy Star. Be sure to stop by Nothing Bundt Cakes, Keva Juice, or Blue Mountain Creamery for a sweet treat before heading home. More offerings are open at Union Square, located at the corner of Union Boulevard and Academy Boulevard, including Target, Play It Again Sports, and Chuck E. Cheese's. The Marketplace at Austin Bluffs provides food, retail stores, and a variety of other services, as well. This area of the Springs also offers short travel time to Briargate, Powers Boulevard, downtown Colorado Springs, and Old Colorado City. Although students may apply for district choice to attend school in any district in the city, Colorado Springs School District 11 primarily serves the area through several noteworthy schools. Palmer High School, located between downtown and Colorado Springs, and Doherty High School are both open to students in the area, depending on the location of their home. The district received an award from the local newspaper recognizing it as one of the city's best workplaces in 2017, and specialty programs are offered for students at both Galileo School of Math and Science and at the Roy J. Wasson Alternative Academic Campus. Listing courtesy of VH Brokers.